For our 75th anniversary issue, we wanted to do something special. 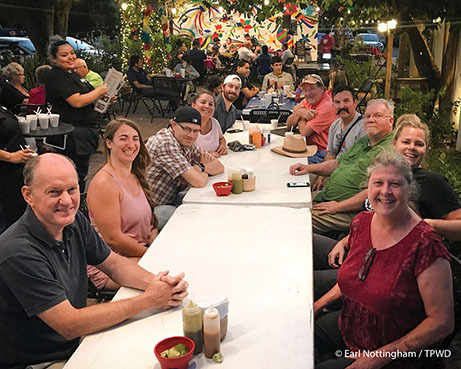 We relocated the entire magazine staff to the Rio Grande Valley — both the editorial and the sales team team set up shop in this remarkable and often surprising place — for a week in September. Estero Llano Grande State Park served as our home base. We worked hard, but it was a labor of love. We spent time briding, hiking, visiting museums, practicing Spanish, getting lost, writing, taking photos, eating great food and meeting wonderful people. Curious as to who tackled what? In lieu of bylines, our initials are included at the end of each piece. Take a moment to meet our staff. Nathan Adams guides the design of the magazine’s print, digital and apps products. With more than 20 years of design experience — 12+ in the magazine publishing industry — his work has been seen in Computer Source Magazine, Huffington Post and The New York Times. Additionally, he is a 15-time recipient of the Society of Professional Journalists’ Excellence in Journalism Awards. Nathan loves a witty pun, a great pair of wing-tips and a jaunty bow tie. 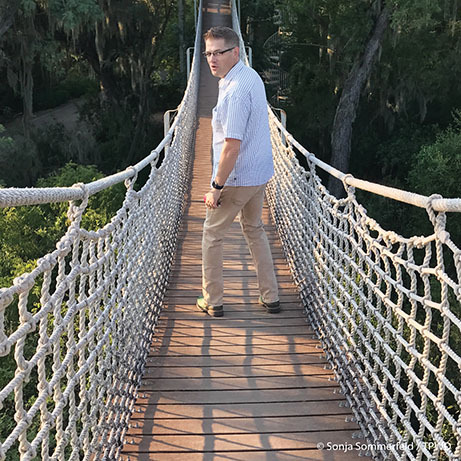 Nathan crosses the bridge at Santa Ana National Wildlife Refuge's observation tower. Traci Anderson has over 20 years of experience in office and HR administration, technical and marketing documentation, website administration and graphics design and creation. Primarily responsible for the finances and accounting concerns of the magazine, she also actively participates in social media marketing, newsletter writing and website creation. In fact, she wrote this! The mother of two teenaged sons, Traci enjoys spending time with her family at the beach, at the ballpark or just discussing the pros and cons of Theodore Roosevelt's presidency over really good burgers. Traci caps off a day of fishing the Lower Laguna Madre with a visit to South Padre Island. 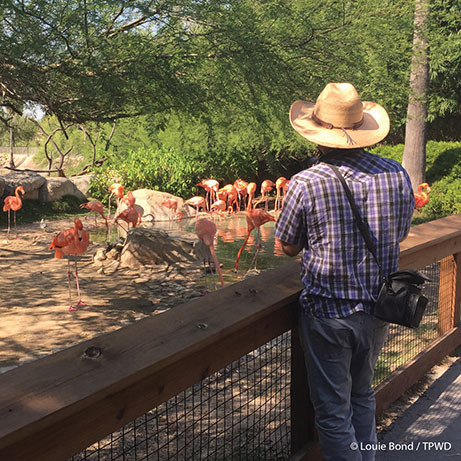 Louie Bond has been with Texas Parks & Wildlife magazine since 2006, serving as editor since 2008. A lifelong Texan, Louie studied journalism at Texas A&M University and worked at various newspapers before turning to magazine work in 2001. She and her husband Mike live in the woods out in the Hill Country town of Wimberley, where they raised four kids. They enjoy all things outdoors and love to play music. 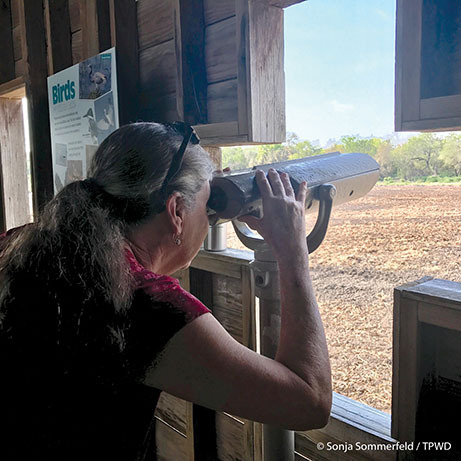 Louie takes advantage of one of the many bird blinds found throughout the parks and refuges on the Lower Rio Grande Valley. Randy Brudnicki has more than 30 years’ experience in the magazine and outdoor communications industries in the private and public sectors, including more than a decade at Texas Parks & Wildlife magazine. He is a frequent contributing writer to the magazine, with a wide-ranging knowledge of hunting, fishing and outdoor recreation from his years working in the tackle and marine industries. An experienced angler, Randy spends his free time with his kids and grandkids — usually on a boat. 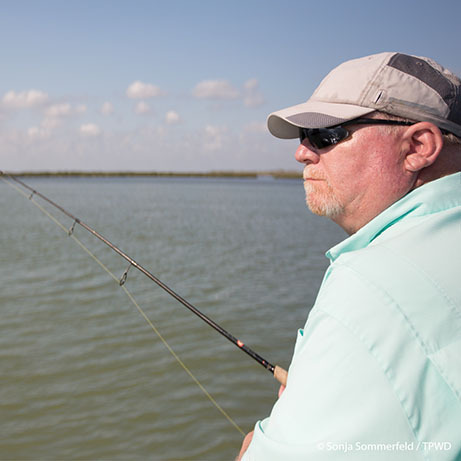 Randy tries his hand at fishing the Lower Laguna Madre. We were thrilled to get soon-to-be retired Texas Parks and Wildlife Department artist Clemente Guzman to accompany us to the Valley. This month's cover is his last work for the agency after 30 years of service. Clemente gains inspiration at the Gladys Porter Zoo. Earl Nottingham is an accredited Master Photographer with numerous regional and national awards. Earl describes himself as a “generalist” when it comes to the varieties of images he shoots on a daily basis for the magazine. According to Nottingham, “I may be photographing wildlife one day, a landscape the next, and a product or portrait of the day after. It’s never dull! ” He lives in Temple with wife Paula and puppy-child Remington. 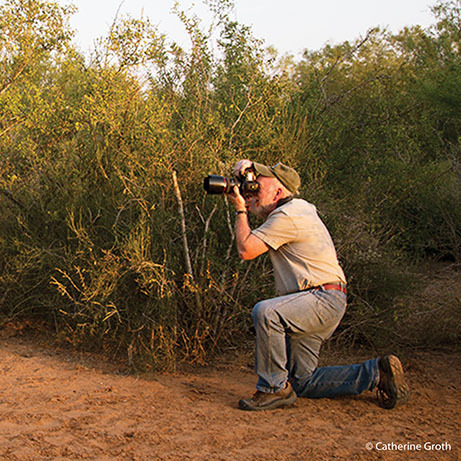 Earl gets the best angle while working on his story for the Special Anniversary issue. Russell Roe holds advanced degrees in journalism and is the go-to guy for all questions regarding words, style and grammar. Russell is an award-winning writer, covering a range of topics in almost every issue of the magazine. He also manages the magazine’s interns and oversees the production schedule. Russell is an avid outdoorsman, and many of our climbing, hiking and bouldering articles are courtesy of his penchant for adventure and derring-do. 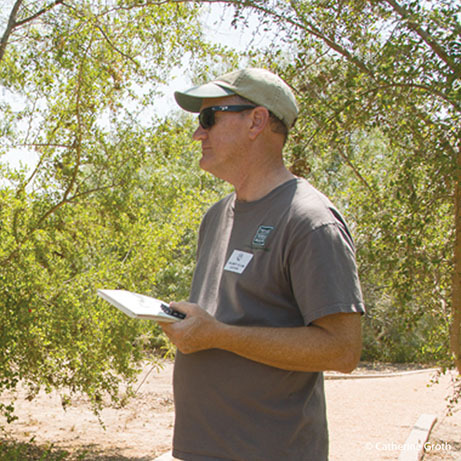 Russell researches conservation issues in the Rio Grande Valley. 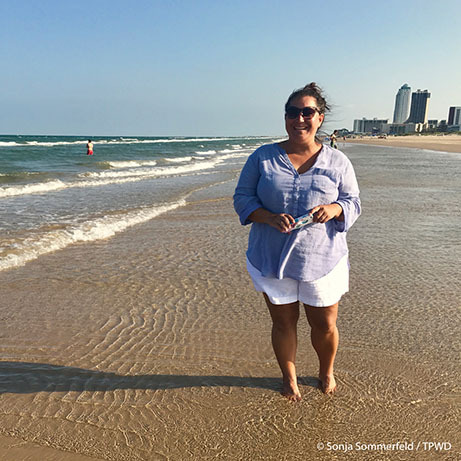 Sonja Sommerfeld had a love of art and photography at a young age. Her mentors allowed her to explore those avenues in darkrooms, fine art classes and journalism. After graduating with a bachelor’s degree from Texas State University, she continued her training in photography, graphic design, photo manipulations, color management and large format printing by working at photo labs, professional print labs and artists’ studios. During this time Sonja worked with some of the top names in the photography industry as well as having her work published in various magazines, textbooks and marketing material. In 2009, she made the leap to Europe to obtain her master’s in photography and photo retouching. Working in Paris and London for the next five years pushed her career to new heights. As the associate art director for Texas Parks & Wildlife magazine she gets to combine her environmental consciousness with the two decades of skills she obtained. 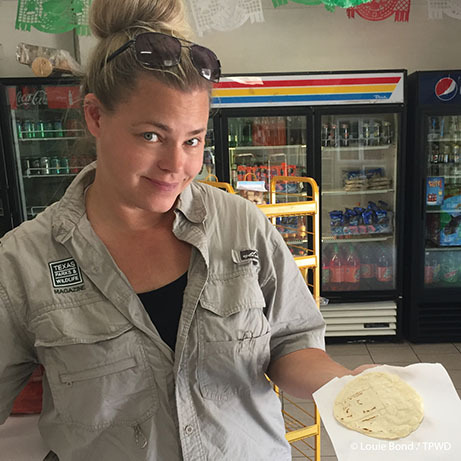 Sonja samples a hot-off-the-comal tortilla at one of the Valley's abundant tortillerias. Photo intern Catherine Groth and ad sales managers Ryan Stone and Jim Stone were also with us in the Valley. While their individual pictures and bios aren't listed above, you can find them in our group photo at the top of the page.